I don’t want to imply that we are living in an era of quitters, but having come across this given up upon PT Cruiser in the U-Pull-It yard, I wonder—is gumption a goner? You’d think that, with the numerous Port-a-Potties and the outdoor hand washing stations with their foot-operated pumps, you could realistically spend days living at your local junk yard. All you’d need to do is to find a reasonably clean minivan in which to sleep and an okay from the employees to let the pizza guy in with your grub on the regular. Despite appearances, I don’t actually live at the junkyard. I do go there often enough that it sometimes feels as though I do. Such is the life of someone with a lot of old cars, and more time on my hands than money. Also, I think my wife likes it when I get out of her hair. The frequency with which I visit my local yards means that I’ve become inured to the banality of what these days makes up most of the typical inventory there. That also means that when something unique and somewhat out of the ordinary turns up, it generally tends to stick out like a proverbial sore thumb. You know what? You just don’t get much sorer or thumb-ier than this car, a custom PT Cruiser Landaulet. Yeah, I know that in proper usage, Landaulet describes a car with an open driver’s partition, and a closed or convertible back passenger area, but geez, what would you call this marvelous beast? Also, pedantic much? Now, Chrysler’s PT Cruiser is a car that many generally love to hate, but I’ve spoken to people who actually own or have owned one, and they tend to cast the car in a different, and far more positive light. Strangely, I find that they almost always love to eat at Applebee’s. Weird, right? Well, someone loved this burgundy over grey cloth four-door PT enough to have its roof chopped off. That beheading wasn’t accomplished in a half-assed manner either. Chrysler did once build a convertible PT Cruiser, that is true, but this isn’t that. That one was a two-door edition that was so oddly proportioned, it gave the impression it spent its time stealing brains for mad scientist. It didn’t even matter if the top was up or down, it was fugly either way. This one though, well, it just looks right. And without all the complicated top mechanism to fool with, I’ll bet it was a lot easier to keep up. That’s right, there’s presently no apparent convertible top on the car. Maybe some junkyard wanderer like myself had already liberated it from the car as some sort of shamanistic trophy. I’m thinking that at some point there must have been a top on this PT. I mean a folding unit—I know it was originally a tin can. Duh. Still evident is a pretty professionally integrated roll-over hoop that maintains things like mounts for the seatbelts and even the dome light. There are also convertible top locator holes and latches on the windshield header. If those were added without the plan of a corresponding top, then I say bravo on maintaining the illusion, Mr. PT Cruiser decapitator. Another indication that this conversion was given some real world engineering rather than just the request to “hold my beer and plug in my Sawzall” is the fact that the former hatch now serves as a working boot lid. That’s some dedication to the effort right there. Sadly, not all dedication works out. 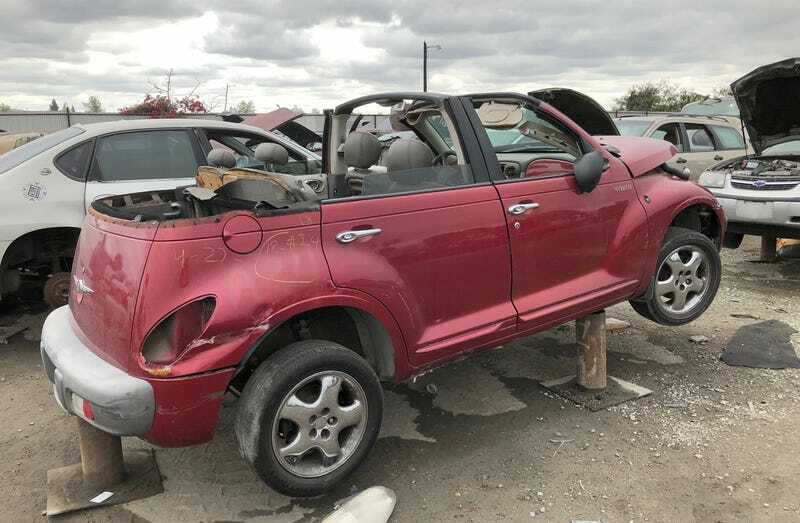 And in the case of this custom PT Cruiser, it appears that working out was eventually not in the cards. No bro, it no longer even lifts. At some point in time, the battle to keep this car on the road was lost. After all that work that went into it, that’s a damn shame. I see a lot of cars in the Junkyard that I feel may have ended up there unfairly. I’ve even shared a few of those with you. For many of them, I get a twang of empathy for the loss. I’m a little conflicted about this one. After all, I’m not generally in the pro-PT Cruiser crowd. I still hate to see an underdog lose, and I’m also not down with seeing someone else’s hard work go for naught. If you feel the same, let’s all pour a forty out at the curb for this bedraggled and beheaded PT Cruiser. Nay, not for the car itself, but for what it represents, and for the recognition that no matter how much we put into our efforts they may one day end up derided and discarded. Until that happens though, I think we all need to keep up the good fight, even when that means going to battle with a PT Cruiser.